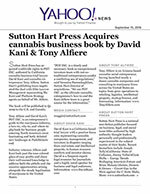 Sutton Hart Press has acquired worldwide rights to POT INC. authored by California cannabis business trial lawyer David Kani and cannabis entrepreneur Tony Alfiere. Sutton Hart's publishing team negotiated the deal with Elite Lawyer Management representing Mr. Kani and Platform Strategy agents on behalf of Mr. Alfiere. The book will be published in Q1 2019 in the U.S. and Canada.